Lately I haven’t climbed any high mountains, haven’t ventured out to any lost cities, I haven’t seen exotic animals (well, except for the occasional mega-Gekko) or exciting rituals. So if you look for a really exciting story then keep looking. This posting is about everything and nothing. About this and that. 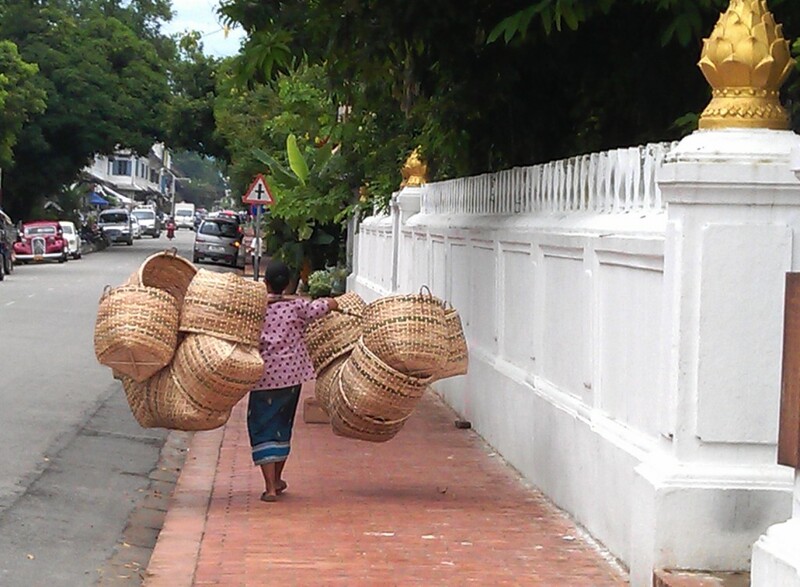 About everyday life in Laos. Some days I wake up and think that I am the luckiest person in the world -and some days I am saying to myself “are you crazy to do that or what?”. Life is so different here from Western Europe and at the same time it isn’t. You have to deal with the same challenges and issues such as annoying neighbors who have nerve-wrecking construction work going on 6 days a week 10 hours a day, flat tires on your motorbike, an empty fridge in the evening and 2 lazy legs that are refusing to go to the next street food place to grab a take-away. And then there are the challenges which I haven’t encountered so far yet in my life such as staff who are impossible to motivate and get them to do their job and a slowness in everyday life that sometimes drives me up the wall (I need to add though that this slowness DOES have its good sides too: when you are late somewhere or you need someone to wait for you then this is nooooo problem at all!). On the other hand I have highlights every day that I would never be able to experience in Austria: my palm- and banana trees-view every morning I step outside (seriously, I never thought that banana trees can make you so damn happy! ), very often bright blue skies and sunshine and a wonderfully empty main street where you most often the only pedestrian for a couple of hundred meters. This morning when I walked to work I saw this woman carrying about 10 huge baskets attached to a wooden pole which she carries on her shoulders (notice how empty the main street is at 8.30 am!?!?!). People here (especially women) are so tough, no matter how old they are they still walk around carrying heavy bags of rice, wood or other things. By the way: I still haven’t screened my 6.500 photos that i have taken since I came back to Laos (90 % of them have to be deleted! ), That will be another “interesting” challenge. In this little town I bump into friends a couple times a day and there is ALWAYS time for a nice chat. Nobody is too rushed. I really like that. I find teaching my novices in the temples everyday for 2 hours still enjoyable. Although I sometimes struggle with them being too noisy and to slack during class (no comparison to our school systems whatsoever). When I had my birthday a couple of weeks ago the novices from one of the temples handed me wonderfully wrapped presents at the end of our class and I was really moved by their thoughtfulness. And at my other temple one of the novices still makes me smile every time when he says “teacher, I am very happy today”. “Why?”, I ask. “Because I see you. I want to see you every day”. OOOOOOOOOOhhhhhh, so sweeet! Food is another neverending subject here. All the expats here have certain cravings after a while. Although you can get quite a lot of things here every now and then we all have a craving for “western” things you can sink your teeth into. And as the selection of cheese (or generally milk products) is limited and extremely pricey I was all the more excited to get close to 2 kilos of wonderful Austrian mountain cheese sent directly from my father to Luang Prabang (thanks, dad!). The next day I invited some of my friends to enjoy this rare delicacy together. Makes you appreciate the “everyday-things” from the western world all the more. 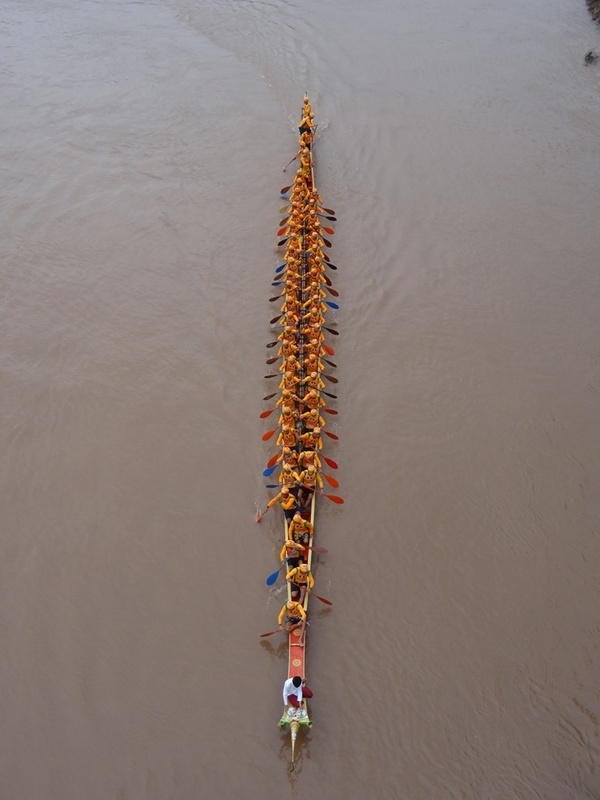 ..somehow reminds me of the little dwarfs in Snow White..
On the 4th of September the big annual boat race took place. 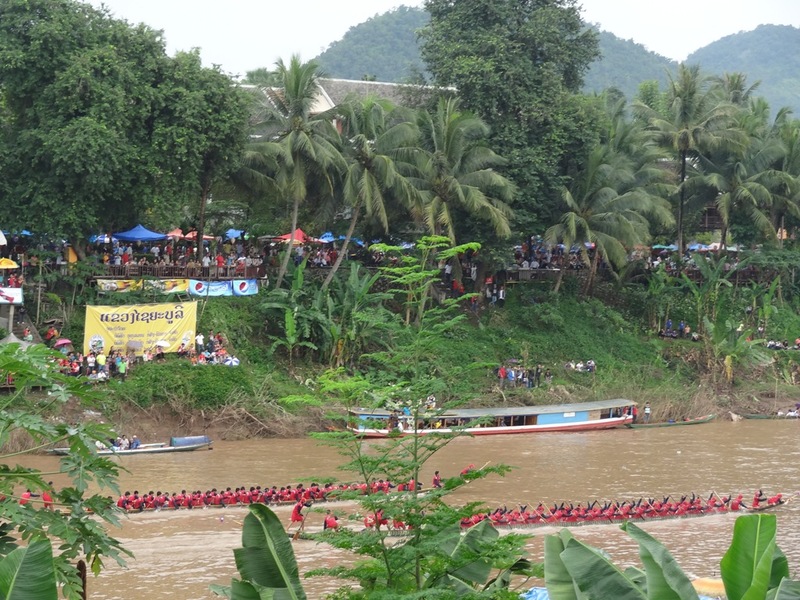 This event is THE event of the year and there were 32 longtail boats competing against each other on the Nam Khan river. The sportive aspect of the event is not the most important thing though for the spetcators. The main thing is incredibly loud music, drinking beer Lao and betting money on the teams. 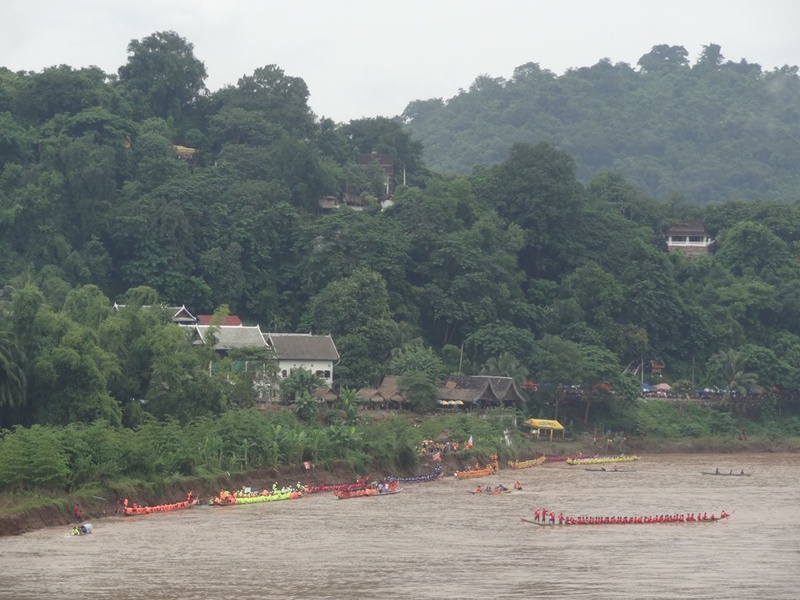 Around noon pretty much the whole of Luang Prabang was drunk and watching the boats became less important. The boats themselves are stunning though I have to say. Massive wood, heavy, very long and elegant – and obviously quite unstable due to its narrow built. 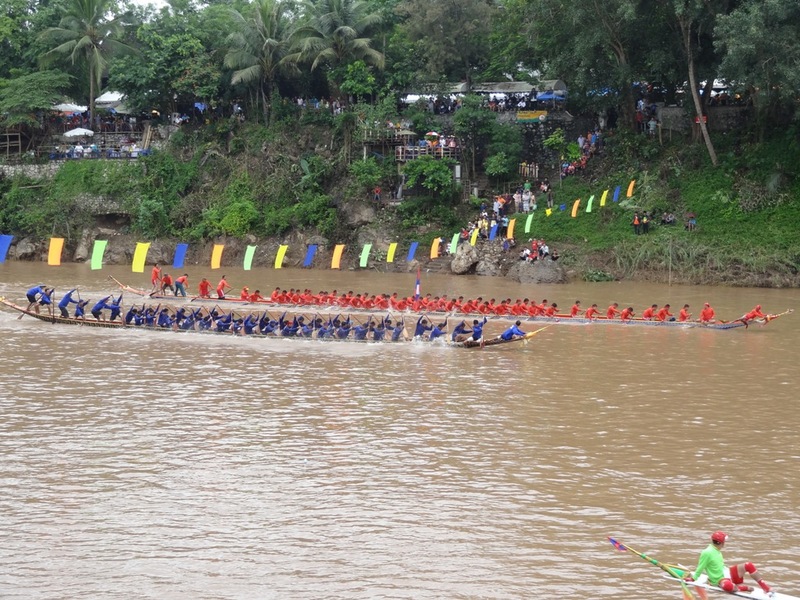 One boat sunk during the race. o-ohh- elephan on a dive-mission! maybe I could take him home? 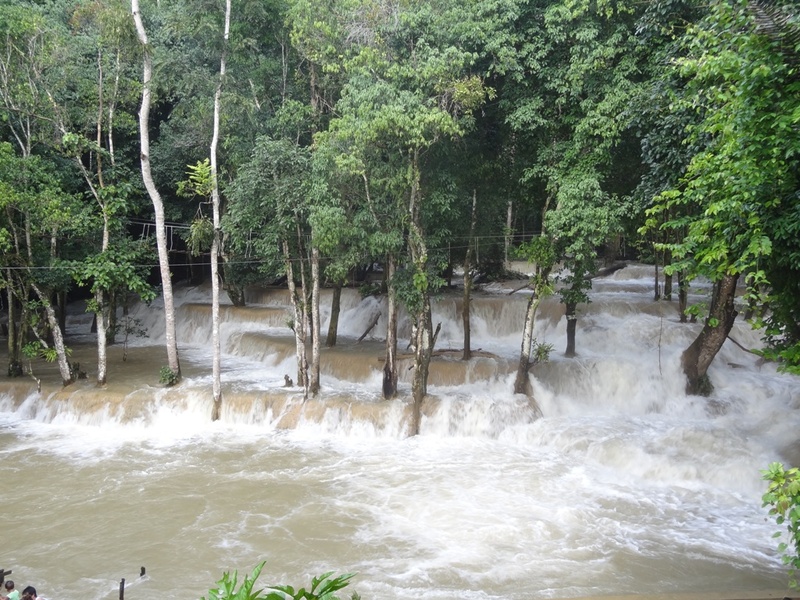 Tad Sae waterfall bursting with water! Today I went to Tad Sae Waterfall with a friend of mine. I love this place. 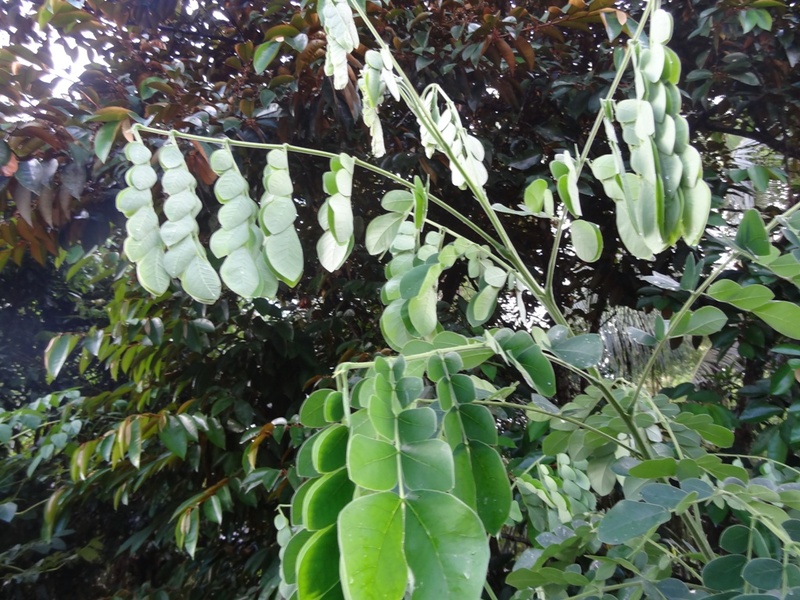 It is in the middle of a lush jungle and it has water only in rainy season. We went there quite late and most of the few remaining visitors left when it started to rain heavily. 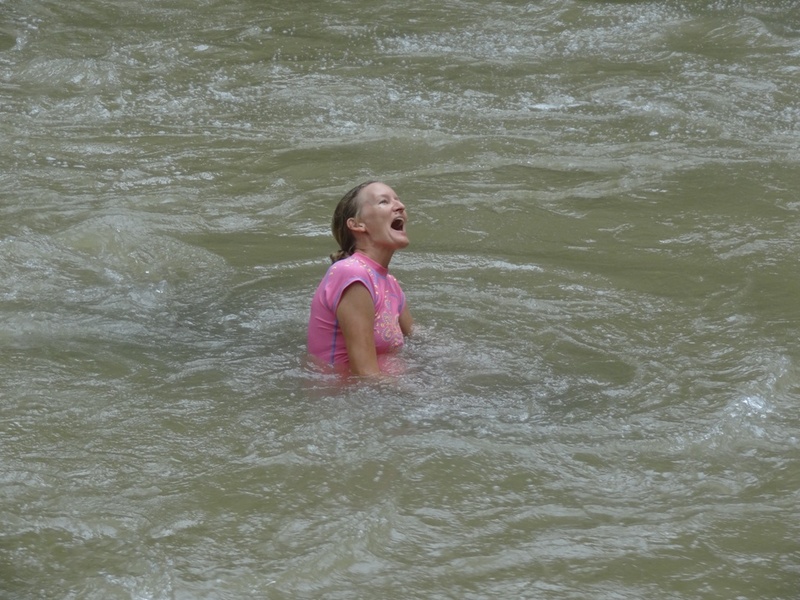 I was contemplating to bathe an elephant in the water- one of the things you can do at the waterfall. As I was going to get wet anyway I decided to do it today as I prefer to have less tourists staring at you while you enjoy this wonderful experience. My elephant was called Moun and she is 10 years old. After I got onto her back (I forgot how bow-legged you have to sit to NOT fall off) she walked to the path leading to the water and within seconds she was in the waterfall-pool. 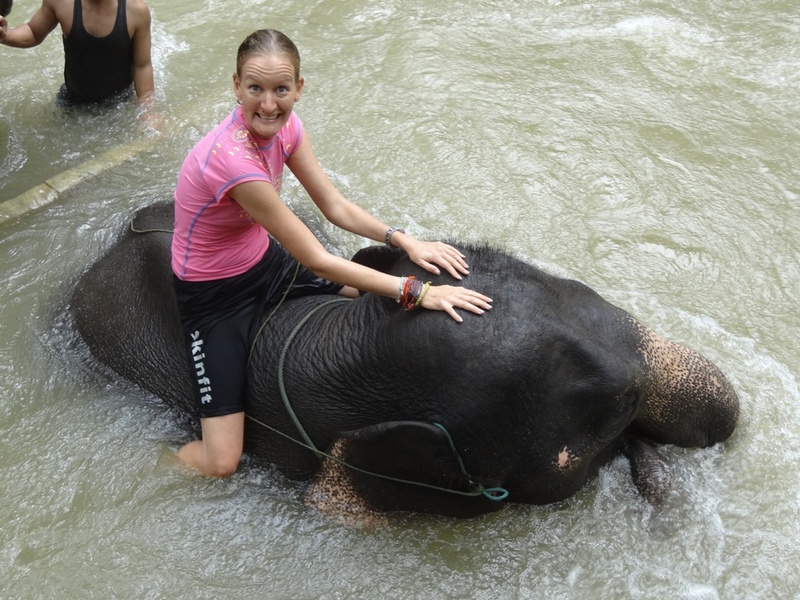 Although this is my 3rd time riding/bathing elephants I once again realized that even if it was the 10.000th time I would be just as exited and happy. For me elephants are one of the most amazing, impressive and wonderful animals on this planet and being able to spend time with them in nature rather than seeing them in a zoo or circus is a real privilege. 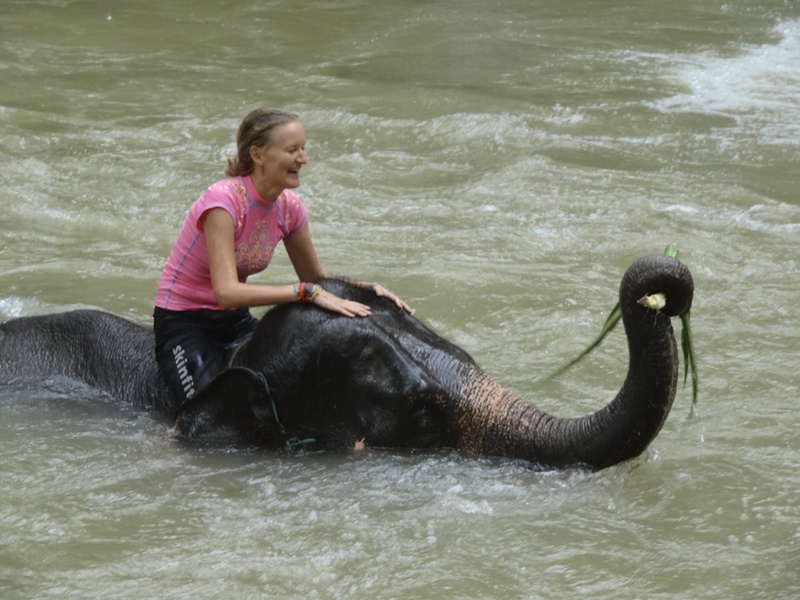 It is such a blast when the elephants fully submerge in the water underneath you and when they come up you are lucky if you still sit on them. 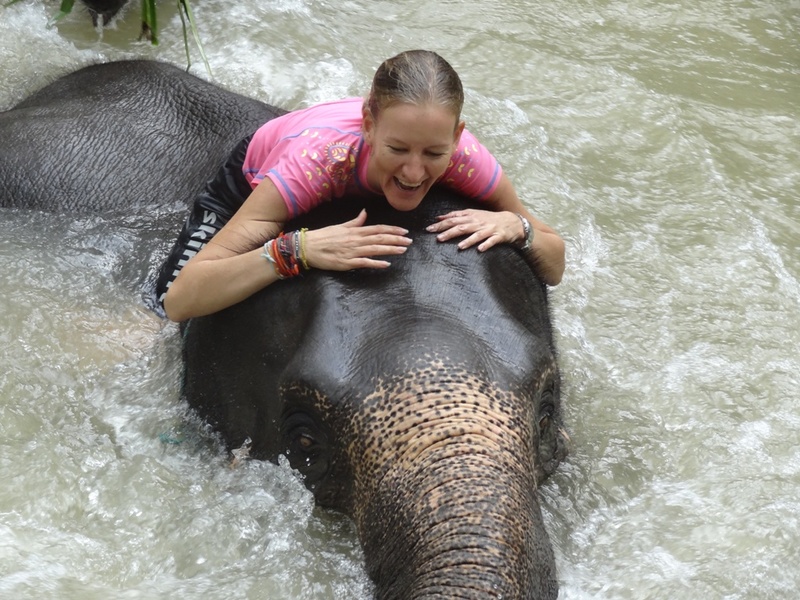 Those 15 minutes with my wonerful elephant made me feel like a little kid again. Happy happy happy. 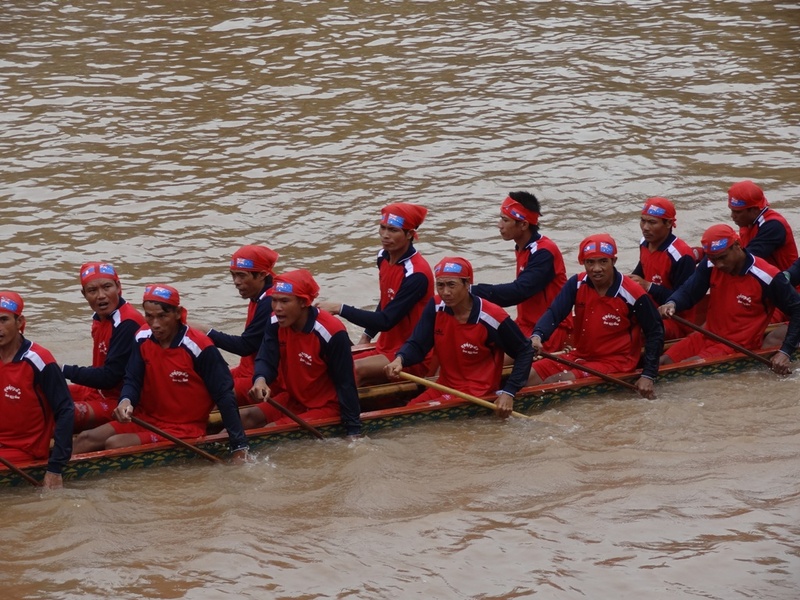 I am ready for many more wonderful experiences here in Laos. Posted by Brita Graser on 8. September 2013 in Laos 2012 and tagged jungle, nature;wildlife;, wildlife. Hi Britta, Steve here from Pt Lincoln. When I was in Laos and staying in Luang Prabang I got locals to help my look for Mahoots (?) tomb, A early French explorer. It is near a waterfall ( not the one you pictured – saw that. never found the tomb but some have. Also I flew to Ponsavan on the Plain of Jars which has an amazing legacy from history and the American war years due to the proximity to the Ho Chi Minh trail. Its a must for me just as LP most favourite place in Asia. You will find it hard to settle after your amazing travels.